Many people struggle to still their minds. This is the biggest reason people think they can never enjoy the benefits of meditation. We will help you overcome this concept and begin to have an enjoyable practice. Do you Struggle to Meditate? 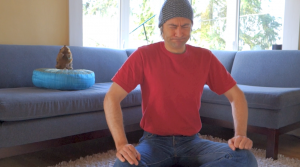 Learning to meditate is rewarding but don’t expect a quick fix. No kidding! This is extremely hard and in fact, a huge reason why you may struggle to meditate. Trying to still the mind and bring it to a place of pure emptiness is an incredible feat of willpower. Is this possible to accomplish? Well, I suppose so but I don’t focus on that. For starters, there’s an easier way. And secondly, if someone accomplishes such a ‘skill’, generally the pride associated with this achievement will be a real obstacle to spiritual growth and attainment which requires an attitude of humility and love.